It doesn’t lead in that quintessential technique of channelling passes that split the defence. It doesn’t lead in making that one pass before the goal-scoring kick. It doesn’t lead in quelling moves of the opposing team. It doesn’t lead in winning battles in the air or making tackles on the ground. 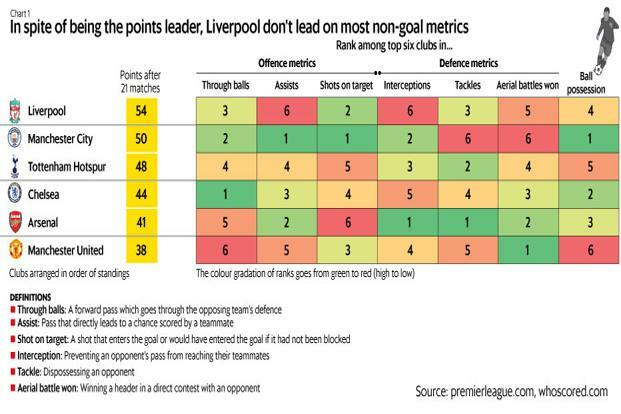 Yet, despite not leading the top six clubs on most intermediate metrics, Liverpool lead the English Premier League (EPL) after a pivotal, physical match last week around the season’s halfway point. Its opponent then was Manchester City, which, in contrast, has done a lot of what Liverpool has not done on non-goal metrics. Among the top six clubs, City lead in ball possession, shots on target and assists, and are second in playing through balls. But a recent slump in form has left City—defending champions and pre-season title favourites—four points adrift of Liverpool. Woven into that performance paradox are fundamental differences between how City and Liverpool have operated this year. Both sides prefer to assemble in the 4-3-3 format (four defenders, three midfielders and three forwards), but what happens subsequently is very different. Both managers—Pep Guardiola at City and Jurgen Klopp at Liverpool—imbibe an attacking spirit, where they like their teams to make things happen. But each side does it differently. For City and Guardiola, possession defines their football style and, consequently, the midfield is the tube through which everything flows: the midfielders are at the centre of action in both defensive and attacking play. For Liverpool and Klopp, football is more about aggressive, high-octane attacks, and so it’s not so much the midfield, but the front line doing the heavylifting on the offensive end and the back line on the defensive end. Take offence indicators, and the implicit assigning of responsibility. Midfielders account for 39% of assists made by City but only 16% for Liverpool. 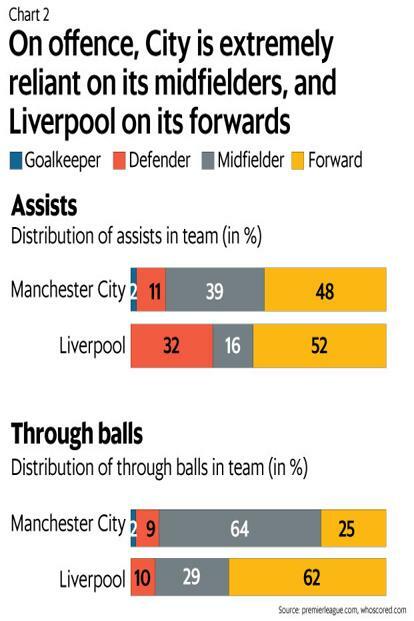 Similarly, midfielders account for 64% of through balls directed by City, but only 29% for Liverpool. This is despite City missing an injured Kevin De Bruyne, who marshalls the midfield like few others in the world, for a good part of the matches. A division of responsibilities tailored to specializations is something that Liverpool seem to emphasise more than City. Among the top six, Chelsea is the other team taking this approach. While Liverpool forwards are doing their thing in offence, their backs are accounting for the major share of the team’s defensive workload. 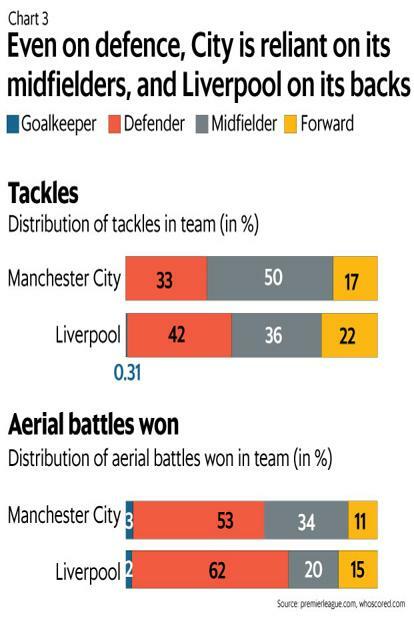 Defenders account for 42% of tackles made by Liverpool and 62% of aerial battles won; the comparative numbers for City are 33% and 53%, with the difference mostly being assigned to City’s midfield. Liverpool defender Virgil van Dijk has been sterling in the air, winning a league-leading 84 aerial battles. The leading City player on this count is Fernandinho, a midfielder, with 47 aerial battles won. This is as much a testament to City’s open, pressing style, as it is to the role of the midfield in coach Guardiola’s game plan. This division of responsibilities seems to have worked well for Liverpool. They have been tight in defence, conceding just 10 goals in the season, of which two came in the recent loss to City. 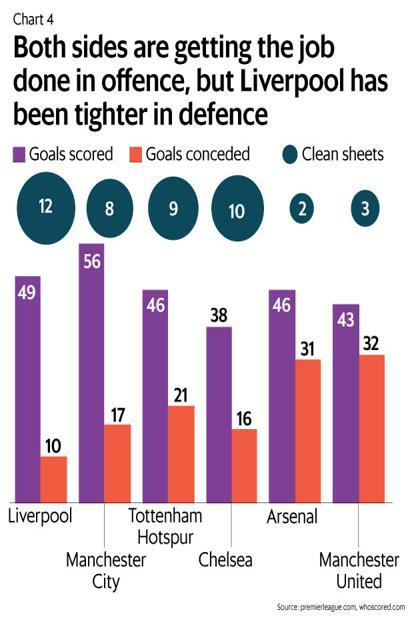 On goals conceded, City is not only behind Liverpool but also behind Chelsea. Also, Liverpool has blanked its opponents in 12 of the 21 games, whereas City has done that eight times. Equally, Liverpool’s forwards—who like making quick, sparky moves and playing the short ball—are getting the job done on the front. On goals scored, Liverpool is only behind City. On a net basis, Liverpool have been more frugal and efficient on both sides than City, and in making it count where it matters. The City midfield versus Liverpool specialists approach also extends to substitutions. For all top six clubs, except Liverpool, around half the time the player pulled out during the game is a midfielder. For City, midfielders account for 53% of players pulled out. For Liverpool, midfielders account for only 36%, and they instead tend to see more fresh legs in their core attack and defence. It’s a tight title race, with Liverpool and City separated by just four points. If City have the expectation of winning, Liverpool have the cross of history. Their different playing styles layer this race further. Has Sushil Kumar won his last medal?